So how's Middlemarch coming along for you? If you said, “Slowly and soporifically,” then we are of one mind, friend! Check back here closer to the weekend, when I'll be posting my thoughts on Books 1 & 2. And if you've been hemming and hawing, it's not too late to throw caution to the wind and join the Middlemarch in March Challenge. Serious literature can be fun when we read it together! In the meantime, those of you who chose to stay out of the Victorian fray might be looking for some lighter fare. And Maria Semple's wacky, satirical romp of a book is just the thing you need. Bee is an eighth-grader living in Seattle with her parents. Her father is a techie-celebrity working for Microsoft on a high-profile and highly-secretive robotics project. Her mother, Bernadette, is a recluse who goes out of her way to avoid leaving their enormous, crumbling house. Unbeknownst to her husband, she has hired a virtual assistant in India named Manjula to handle her daily tasks. However, she can't quite manage to avoid nasty run-ins with neighbor Audrey Griffin, who already dislikes Bernadette due to her unwillingness to volunteer at the kids' school. There's an argument about blackberry bushes and a screaming fight in a driveway. Also someone's foot almost gets run over in the school pickup line. You know, typical first-world problems. Bee wrangles her parents into planning a family vacation to Antarctica. 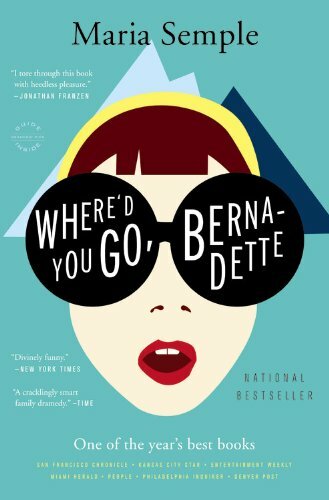 Bernadette starts out with good intentions, asking Manjula to order parkas and ski pants, but eventually the stress of her life becomes too great, and Bernadette disappears. The book consists of articles and evidence that Bee has assembled to try to locate her missing mother. There are emails between Bernadette and Manjula, correspondence between the dreaded Audrey Griffin and her gossipy crony Soo-Lin, stern letters from Bee's school principal, and sundry other items that together paint a picture of a depressed and slightly deranged woman. However, Bee knows her mother, and knows that she would never abandon her. So whether you're in need of an antidote to the cold, dreary weather of early March, or if you're in need of a darkly comic escape from the heavy seriousness of Middlemarch, look no further than Bernadette Fox.